Bruce Gagnon is the Coordinator of the Global Network Against Weapons & Nuclear Power in Space. He was a co-founder of the Global Network when it was created in 1992. 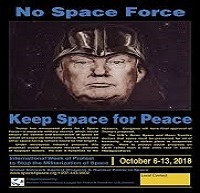 Host Stuart Richardson speaks to Bruce about the newly proposed “Space Force”, the lunacy of creating a massive new military expenditure and how the government is planning on funding it. And what we can do as citizens to stop these projects by envisioning the money being spent on more human centered programs like climate change which is a win, win ,win as it creates jobs, mitigates climate change and moves us towards peace. This entry was posted in Uncategorized and tagged be the media, bloggers, borders, bruce gagnon, community, dispatches, environment, global news, global warming, how to listen, immigration, international, internet, interviews, itunes, labor, latin waves media, media, media democracy, media search engine, membership, Militarism, movements, nother world is possible, on-air, passion, political, politics, radio, social change, Space Force, Space4peace, Stuart Richardson, Sylvia Richardson, syndicated, twitter. Bookmark the permalink.